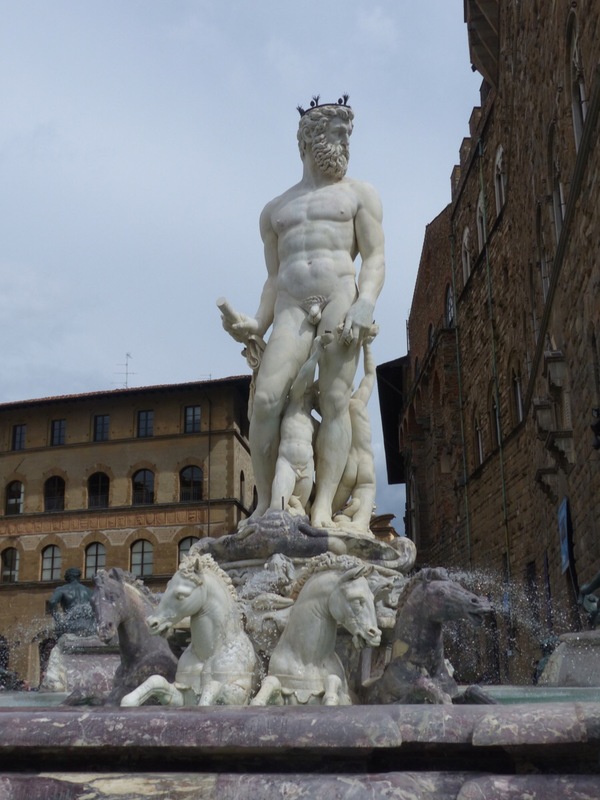 The magnificent Neptune Fountain in Piazza Signoria in Florence is on full view again after being covered for restoration for 2 years. The restoration project costing €1.5 million was funded by Salvatore Ferragamo. The first public fountain in Florence, it was commissioned by Cosimo I de Medici in 1559 after a competition to chose a design. Baccio Bandinelli was chosen as the winner but he died before the work began. Bartolommeo Ammannato took over the project. 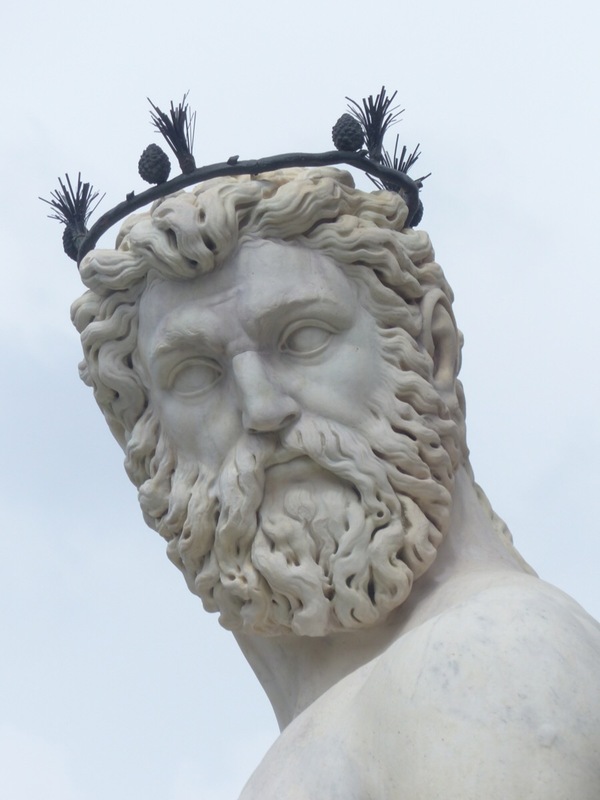 The 4.2 metre Neptune stands high above all else in the middle of the fountain. It is said that his face resembles that of Cosimo I de Medici. 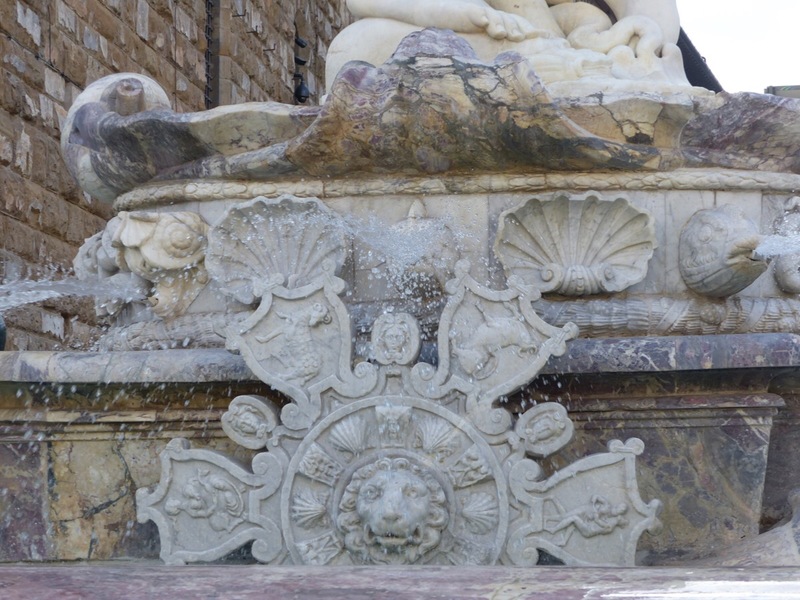 The central part of the fountain with Neptune on a pedestal with the mythical figures of Scylla and Charybdis was completed in 1565 in time for the wedding of Francesco I de Medici and the Grand Duchess Giovanni d’Austria. The basin surrounding Neptune, decorated with bronze nymphs, fauns, satyrs and marble seahorses took another 10 years. 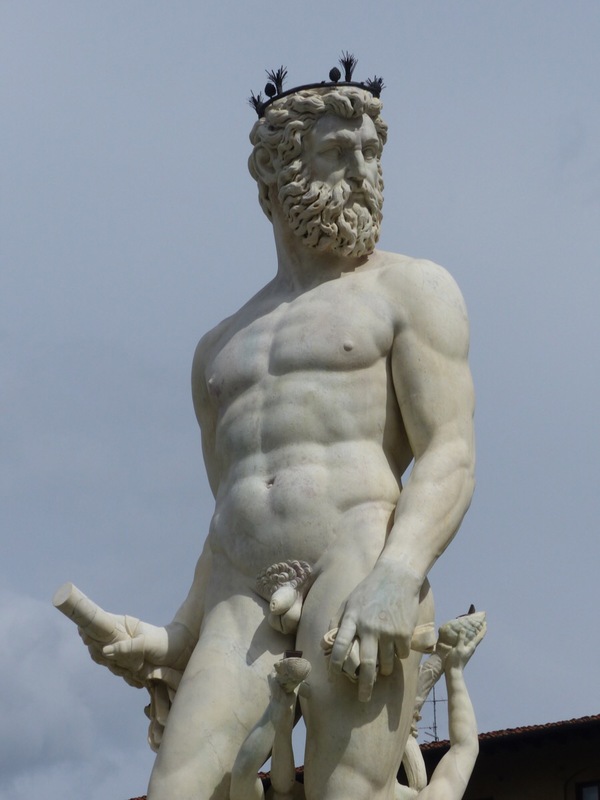 Neptune is made from white Carrara marble and was sarcastically called Biancone, white giant, when he first appeared. The one on show now is a copy made in the 1800s. The original is in the National Museum. The detail in the sculptures is now easy to see. The inner workings have been renovated too and water flows in the fountain for the first time in years. 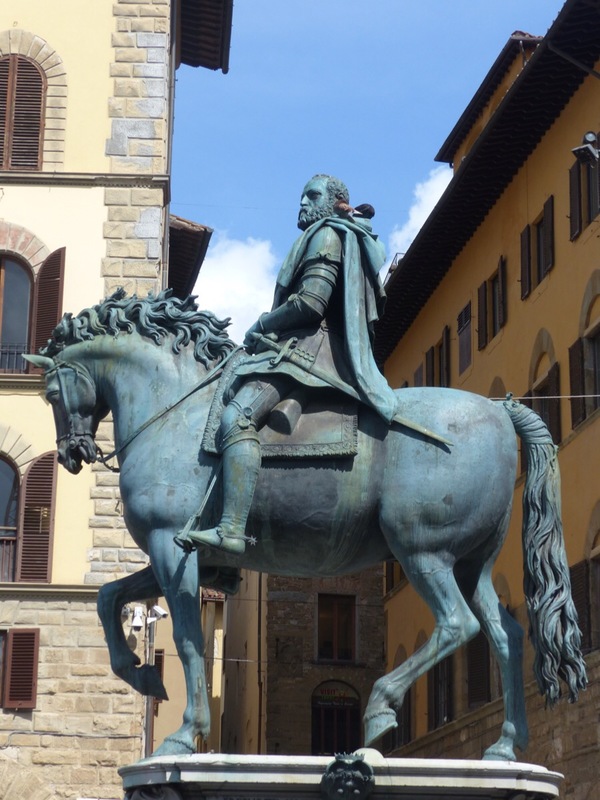 Cosimo I de Medici sits calmly on his horse beside Neptune. 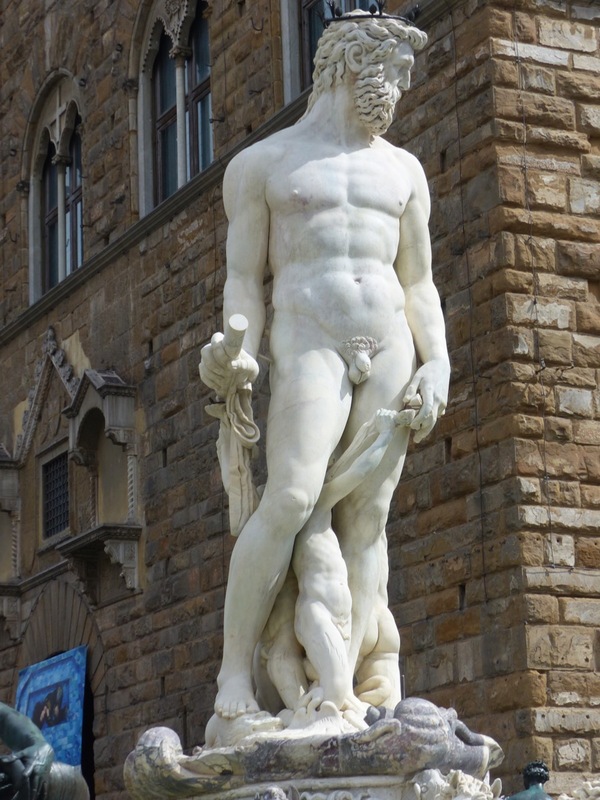 This statue was commissioned by Cosimo’s son, Ferdinando I de Medici in 1594. The work continues with workers concentrating on cleaning. 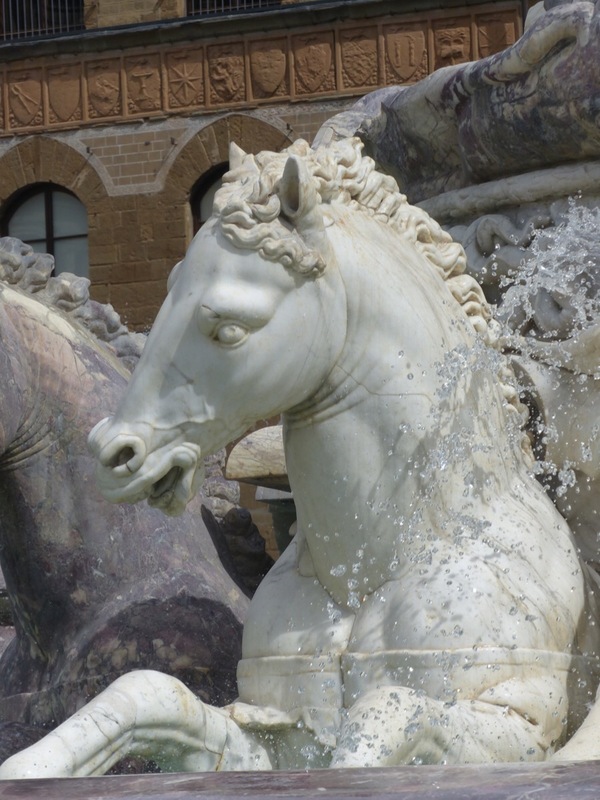 Piazza Signoria is the beautiful heart of Florence and the restored fountain is makes it even better. Beautiful photos. What a major restoration job! The fountain is looking fabulous. He will be there waiting for you. Looking forward to seeing it …. It is looking great and it is good to see the water flowing. Wow, Signor Biancone certainly does sparkle! I’m always amazed when I see such big numbers for a project like this. Granted, it’s a large sculpture with fountain, but it makes you wonder who’s getting what. 2 years of who knows how many people’s time, and clearly they’re not just going at it with a toothbrush. The whole thing was pulled apart. The bronze statues were cleaned inside and out and the waterworks were cleaned out. Water had not been flowing for years…a huge amount if work. It is always great to walk into the piazza and see Neptune. Was the water working when you were there….I saw it in its full glory, water working also on my last days in Florence. Only some of the water was turned on, no doubt because there were workers in the basin. It really is a magnificent statue and fountain. So pleased that it is back in action. Reblogged this on Travels About Town.